Garmin Foretrex 201 is a wearable Personal Navigator, for the outdoor enthusiast. Built rugged for adventure, this wrist-top device is perfect for hikers, campers and climbers who want a useful GPS in a lightweight, waterproof and affordable package. 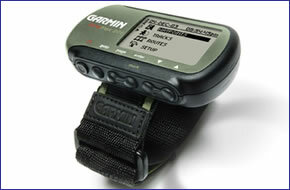 Garmin Foretrex 201 has been discontinued. The Garmin Foretrex 201 is a wearable Personal Navigator, for the outdoor enthusiast. Built rugged for adventure, this wrist-top device is perfect for hikers, campers and climbers who want a useful GPS in a lightweight, waterproof and affordable package. The Garmin Foretrex 201 offers the most essential navigation data, enhanced GPS accuracy, and extensive storage of waypoints, reversible routes, and track information. The Garmin Foretrex 201 also features a timing feature. This feature is especially designed to meet the timing needs of dingy/sailboats racing, but it is also configurable and could be useful to other sports. The Garmin Foretrex 201 offers hands-free GPS navigation information, allowing you to concentrate on your outdoor activities. The Garmin Foretrex 201 features six dedicated buttons (GoTo, Page, Enter/Mark, Up, Down and Power), making it one of the easiest GPS units on the market to operate. The Garmin Foretrex 201 also includes Garmin's exclusive TracBack technology which allows you to mark your campsite, go trekking all day, and then follow the electronic "breadcrumb trial" back to camp in time for dinner. Do you have a question about the Garmin Foretrex 201 or other handheld GPS related question that's not been answered on this webpage? Please see our handheld and Outdoor GPS FAQs page for questions from other customers.Plus if the answer to your question isn't featured, use the online form to ask us for the answer. Alternatively please telephone 01733 777623 Monday to Friday (9:30am-5:00pm) to speak to one of our sales team.